Introducing Gemtor’s new single span horizontal lifeline system. This system is the perfect choice for bridge and building construction. Designed for quick and easy mounting to structural I-Beams, this complete kit includes everything you need to protect your workers while working/walking at heights. Each system can be used on a span of up to 60 ft. and multiple systems can be connected together to cover greater spans. Mounting bolts located on the top side of the stanchion base make mounting to beam safer and easier than competitive models, zinc plated chain and quick insert pins save time and increase durability. Stanchions are extremely strong yet lightweight and mount on the beam at an angle to keep the lifeline out of the worker’s way. HL3-30 – Portable Horizontal Lifeline System for up to 30 ft. span. Includes; two (2) stanchions, energy absorber, cable and hardware. HL3-60 – Portable Horizontal Lifeline System for up to 60 ft. span. Includes; two (2) stanchions, energy absorber, cable and hardware. 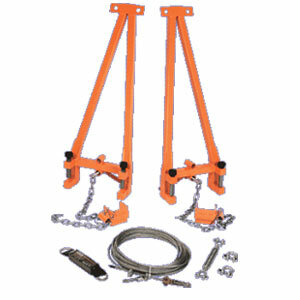 HL3-3A – Add-on system for up to 30 ft. span. Includes; one (1) stanchions, energy absorber, cable and hardware. HL3-6A – Portable Horizontal Lifeline System for up to 60 ft. span. Includes; two (2) stanchions, energy absorber, cable and hardware.